RIYADH (Reuters) - U.S. Defense Secretary Ash Carter and his Gulf Arab counterparts met in Riyadh on Wednesday to discuss ways to counter Iranian influence and fight the Islamic State group, hours before President Barack Obama arrived in Saudi Arabia. 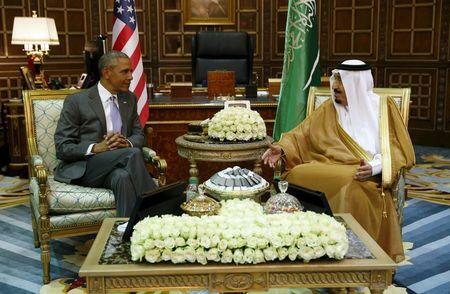 Obama will meet Saudi King Salman before a summit with all the leaders of the Gulf Cooperation Council (GCC), also in Riyadh, on Thursday, with shared security and defense issues likely to dominate the agenda. Obama and Carter will seek to reassure the GCC, which groups Saudi Arabia, Kuwait, Qatar, Bahrain, the United Arab Emirates and Oman, that Washington still shares their interests and will continue to ensure their security, U.S. officials have said. In part, Carter aims to do so by helping them build up their cyber, special operations and maritime capabilities, which U.S. defense officials see as more effective in countering Iran than their historical big spending on air power. Carter and the GCC defense ministers agreed to cooperate in building the GCC states' joint missile defense systems, and in developing special forces, the bloc's Secretary General Abdullatif al-Zayani said, but no new arms deals were announced. Carter urged the GCC countries to donate funds for the reconstruction of Sunni areas of Iraq including Anbar, Ramadi, and Hit. The GCC's mostly Sunni Muslim monarchies, with the exception of Oman, see Shi'ite Iran as a threat to their security and say its involvement in Iraq, Syria, Lebanon and Yemen has fueled conflict and deepened sectarian divisions. The White House shares their view that Tehran plays a destabilizing role, but has said it hopes to bring Iran and Gulf Arab states to develop a "cold peace" in which their rivalry does not further inflame smoldering Middle East tensions. U.S. Army Lieutenant General Sean MacFarland, head of the U.S.-led coalition against Islamic State, briefed the group on the campaign, and the commander of U.S. forces in the Middle East General Joseph Votel briefed the group on Iran's activities in the region. Saudi Defence Minister Prince Mohammed bin Salman earlier said Gulf states and the U.S. must "work together to confront these challenges", the kingdom's state news agency reported. However, last year's nuclear deal between Iran and world powers including the United States was seen by Gulf Arabs as a sign that Washington was making overtures to Tehran, and they fear Obama also wants to reduce U.S. involvement in the region. Strengthening the Gulf Arab states' military and security capabilities has been part of Obama's reassurance in recent years that he will support them. Washington has also given behind-the-scenes assistance for the Saudi-led coalition campaign in Yemen. Talks on helping Gulf states build up their security capacity feed into that. Improving their maritime capabilities, for instance, would help them to interdict arms shipments that Riyadh believes are being smuggled into Yemen by Iran. Carter also arrived in Riyadh hoping to win pledges from Gulf allies to help pay for the reconstruction of areas of Iraq damaged by the fight against Islamic State, a hardline Sunni Islamist group that seized parts of Iraq and Syria in 2014. Iraq is struggling to fund an expensive fight against Islamic State amid low oil prices, but even the wealthy Gulf countries have had to enact spending limits or consider doing so given their dependence on oil sales as a revenue source.